In the 1700s, Henrik Ling from Sweden developed the Swedish massage, which is particularly geared towards allowing the body to take in more oxygen and thereby, rejuvenating the body. 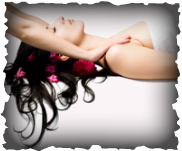 Swedish massage uses firm but gentle pressure to promote relaxation ease muscle tension and create other health benefits. So far, the Swedish massage has been considered one of the best methods of a basic massage because it increases circulation without increasing heart load. In addition it reduces stress, both emotional and physical, and is very affective in a regular program for stress management. Stimulates the flushing of metabolic waste products (lactic acid, urea and uric acid) from the body's muscle tissue.